Condemning drugs as the “single most destructive element present in our current culture,” L. Ron Hubbard offered a solution to a social problem that has since proven workable many thousands of times over. In the new publication, L. Ron Hubbard: Rehabilitating a Drugged Society, you can read about his exploration into the genesis of drug abuse. His revolutionary breakthroughs in effective drug rehabilitation methods are analyzed and commented upon by leading authorities. 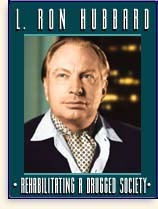 In this, one of the most recent in a series of specialized publications on various aspects of the life of L. Ron Hubbard, what leads people to begin taking drugs is explained, along with how the use of these substances interferes with communication skills, comprehension and ability — and how the body can be detoxified. L. Ron Hubbard: Rehabilitating a Drugged Society can be obtained by writing to the Church of Scientology International, 6331 Hollywood Boulevard, Suite 1200, Los Angeles CA 90028. Complimentary copies are available to religious leaders, government officials and members of the news media at this address.